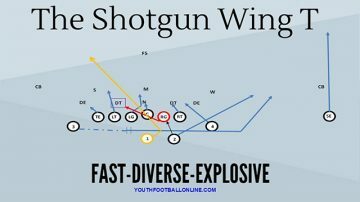 The Cross blitz out of the 4-3 Defense is easy to install and it works very well on the youth football level. 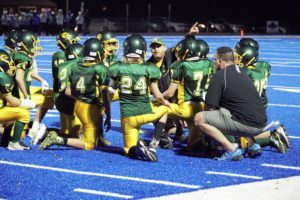 Since youth football consist mostly of runs, this blitz is designed to defend against off-tackle and outside plays. Man to man coverage will be played behind this blitz. However, you can definitely run zone behind it as well. 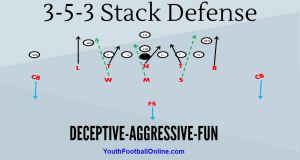 The 4-3 Defense is a great defense for youth football because it allows you to be multiple. You can be multiple in your coverage, blitzes and stunts. This defense can easily align to spread formations and easily align to compressed double tight-end formations. You can roll a safety down or you can stay in a two high structure, there are several different variations. Defensive Tackle (blitz side): A-gap responsible. Defensive End (blitz side): Dip and rip, slant B-gap. Mike (M): Pre-snap show A-gap blitz, then blitz B-gap when the ball is snapped. Gap exchange with defensive end. Sam (S): Blitz off of the edge, maintain contain. Always keep outside shoulder free! Will (W): Read step B-gap, then pursuit. CB: Man coverage on the Z.
CB: Man coverage on the X.
SS: Roll down. The SS is free to run to the ball carrier. He must key the TE to make sure it is not a pass. If it is a pass, the SS locks onto the TE. FS: Deep middle 3rd. Free safety needs to be 12 yards deep, in the middle of the field, not over the ball. Slanting defensive end needs to dip & rip and then anchor his gap. He cannot allow himself to get washed down. This blitz is designed to be executed to the strength of the formation. When called on to blitz, your defenders need to attack on ball movement. Halfhearted blitzes will get your defense toasted. Blitzing defenders must attack their assigned gap. You cannot have two defenders forcing one gap. Blitz strategically! Don’t blitz for the sake of just blitzing. You have the option to play press man or off man coverage. Regardless, inside leverage should always be maintained.